Enjoy the freedom to control your audio entertainment from anywhere on or around your boat. Whether you’re standing in your favorite fishing spot or about to jump off the swim platform, wireless audio control can be within reach any time, anywhere – it’s never been so easy. 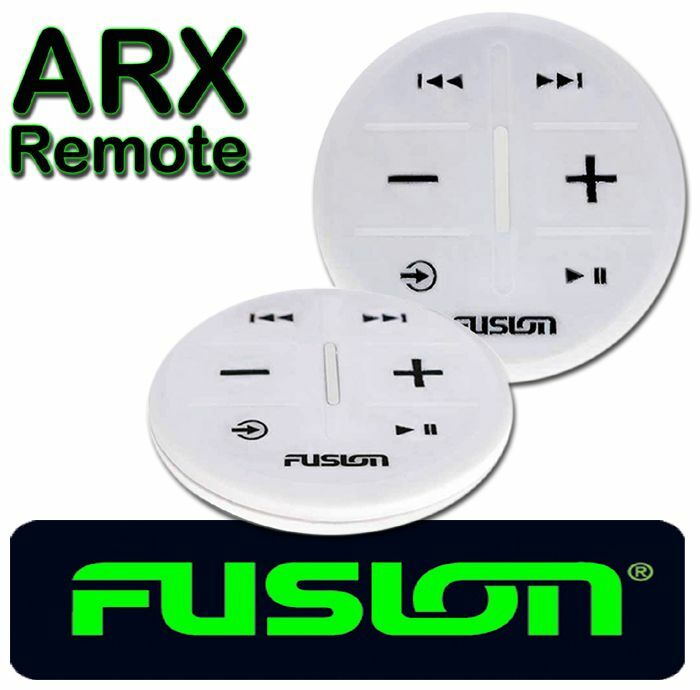 This remote can be used across a variety of Fusion ANT-enabled products including the 70 Series, 755 Series, StereoActive, Apollo RA770, Panel-Stereo and MS-BB100. Forget about the hassle of cutouts and wires – with the ARX70 ANT remote, you only need to stick it on to any flat surface and press play to enjoy wireless audio control. Using a semi-permanent adhesive, the ARX70 makes installation in many locations quick and easy. Your options are endless when it comes to remote placement. Stick your ARX70 where it is most convenient, whether it is the swim platform, bow rider, transom fitment, your favorite fishing spot, or any of the above! Whether you are on the boat or in the water, the wireless ARX70 remote gives you the freedom of audio control from anywhere you choose. Simply install the remote anywhere on your boat, from the swim platform to your favorite fishing spot, to access easy, wireless audio control. Designed for use anywhere on board, the ARX70 is rated IPX6 and IPX7 water resistant. This makes it ideal for installation on the swim platform, bow rider or transom fitment on your boat, with peace of mind that your remote is built to last wherever it is installed on board.